Occipital Lobe: The occipital lobe is one of the four lobes of the cerebral cortex in the brain. The occipital lobe is positioned at the back portion of the brain and is associated with understanding visual stimuli and information. The primary visual cortex region is Brodmann area 17, usually termed V1 (visual one).V1 is placed on the medial side of the occipital lobe inside the calcarine sulcus; the full extent of V1 frequently continues onto the posterior pole of the occipital lobe. V1 is usually designated striate cortex because it can be classified by a large stripe of myelin, of the Stria of Gennari. Visually driven areas outside V1 are designated extrastriate cortex. There are numerous extrastriate regions, and these regions are particular for different visual tasks, such as color differentiation, visuospatial processing, and motion perception. Injury to the occipital lobe can induce visual difficulties such as trouble with recognizing objects, an inadequacy to identify colors, and difficulty recognizing words. The two occipital lobes are the tiniest of four paired lobes in the cerebral cortex. The occipital lobes are positioned in the rearmost portion of the skull, the occipital lobes are part of the forebrain. The occipital lobe is marked as the component of the cerebral cortex that lies underneath the occipital bone. The lobes of the occipital rest on the tentorium cerebelli, a part of dura mater that divides the cerebrum from the cerebellum. They are structurally separated in their respective cerebral territories by the separation of the cerebral fissure. At the front edge of occipital lobes are numerous lateral occipital gyri, which are divided by the lateral occipital sulcus. The occipital viewpoints along the inner face of each hemisphere are separated by the calcarine sulcus. Beyond the medial, Y-shaped sulcus rests the cuneus, and the place under the sulcus is the lingual gyrus. Occipital Lobe Location: Bottom, back part of the cortex. 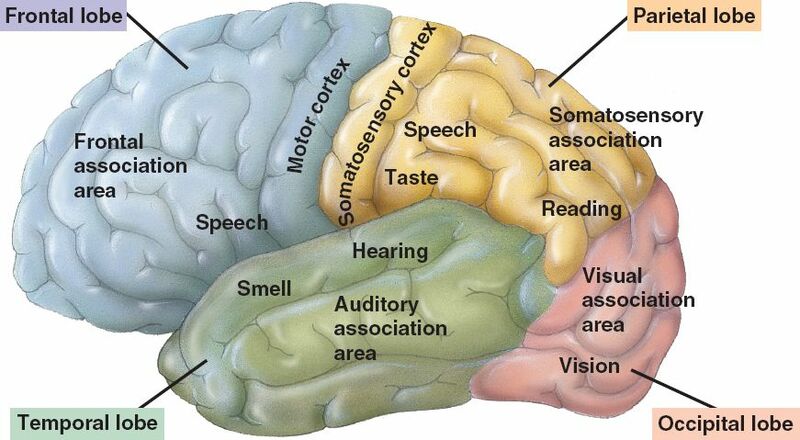 The occipital lobe is a visual processing station of the individual mammalian brain comprising most of the anatomical area of the visual cortex. The second cranial nerve is the optic nerve, fibers arise from the retina to make the optic nerve. 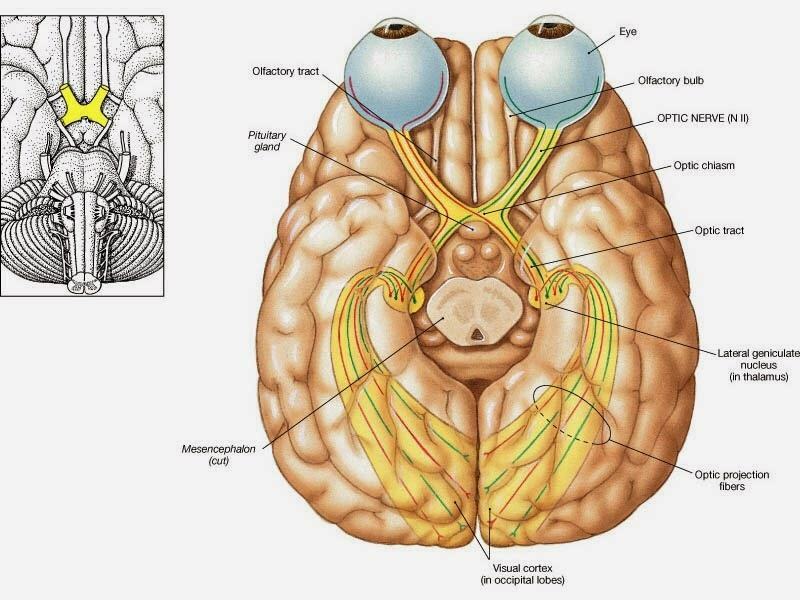 Thalamic fibers run to the occipital cortex, where visual interpretation happens. • Its primary occipital lobe function is processing, integration, interpretation, vision and visual stimuli. • Primary visual cortex is the primary area of the brain capacity for the sight recognition of size, motion, color, dimension etc. • Controls visual perception is also a chief occipital lobe function. If one occipital lobe is injured, the outcome can be homonymous hemianopsia vision loss from similarly put "field cuts" in each eye. Occipital lesions can induce visual hallucinations. Lesions in the parietal-temporal-occipital are correlated with movement agnosia, color agnosia, and agraphia. Injury to the primary visual cortex can create blindness due to the holes in the visual projection on the surface of the visual cortex that occurred from the lesions.